Bleeding into the vitreous chamber or a space created by vitreous detachment. Epidemiology: The annual incidence of this disorder is seven cases per 100000. ❖ 1. Bleeding from normal retinal vessels as can occur as a result of mechanical vascular damage in acute vitreous detachment or retinal tear. ❖ 2. Bleeding from retinal vessels with abnormal changes as can occur as a result of retinal neovascularization in ischemic retinopathy or retinal mac-roaneurysms. ❖ 3. Influx of blood from the retina or other sources such as the subretinal space or the anterior segments of the eye. ❖ Posterior vitreous detachment with or without retinal tears (38%). ❖ Proliferative diabetic retinopathy (32%). 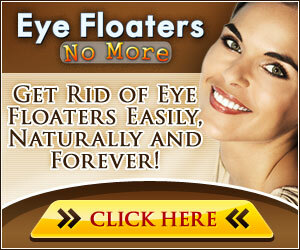 ❖ Age-related macular degeneration (2%). ❖ Terson's syndrome (subarachnoid hemorrhage, increase in intraocular pressure, acutely impaired drainage of blood from the eye, dilation and rupture of retinal vessels, retinal and vitreous hemorrhage). Symptoms: Patients often report the sudden occurrence of black opacities that they may describe as "swarms of black bugs" or "black rain." These are distinct from the brighter and less dense floaters seen in synchysis and vitreous detachment. Severe vitreous hemorrhage can significantly reduce visual acuity. Approximately 10 ^l of blood are sufficient to reduce visual acuity to perception of hand movements in front of the eye. Diagnostic considerations: Hemorrhages into the vitreous body itself do not exhibit any characteristic limitations but spread diffusely (the blood cannot form a fluid meniscus in the gelatinous vitreous body) and coagulation occurs quickly (Fig. 11.6). Vitreous hemorrhages require examination with an ophthalmoscope or contact lens. The contact lens also permits examination of the retina at a higher resolution so that the examiner is better able to diagnose small retinal tears than with an ophthalmoscope. Ultrasound studies are indicated where severe bleeding significantly obscures the fundus examination. Bleeding in the tissues adjacent to the vitreous body, i.e., in the retrohyaloid space, Berger's space, or Petit's space (Fig. 11.2), can produce a characteristic fluid meniscus. This meniscus will be visible under slit-lamp examination (Fig. 11.6b). ❖ 1.The bleeding usually does not continue to spread into the vitreous body. ❖ 2. The blood in the retrohyaloid space will settle more quickly. Next the cause of the vitreous hemorrhage should be treated, for example a retinal tear may be treated with a laser. Vitrectomy will be required to drain any vitreous hemorrhage that is not absorbed. 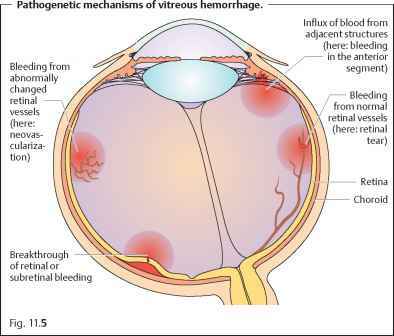 Clinical course and prognosis: Absorption of a vitreous hemorrhage is a long process. The clinical course will depend on the location, cause, and severity of the bleeding. Bleeding in the vitreous body itself is absorbed particularly slowly. Figs. 11.6a and b a Diffuse vitreous hemorrhage. The view of the fundus is obscured by the vitreous hemorrhage; details are clouded or completely obscured. The star indicates the center of the vitreous hemorrhage; the arrow indicates the optic disk. b Retrohyaloid bleeding with formation of a fluid meniscus. The image shows bleeding into a space created by a circular vitreous detachment. Gravity has caused the erythro-cytes to sink and form a horizontal surface.